From the critically acclaimed author of Honor Girl, comes a “sassy, sultry whodunit” (School Library Journal) set in an Atlanta boarding school that’s infused with subversive humor and featuring a cast of bizarre and unforgettable characters. It’s better to know the truth. At least sometimes. Halfway through Friday night’s football game, beautiful cheerleader Brittany Montague—dressed as the giant Winship Wildcat mascot—hurls herself off a bridge into Atlanta’s surging Chattahoochee River. Just like that, she’s gone. Eight days later, Benny Flax and Virginia Leeds will be the only ones who know why. Their search for the truth reveals a web of depravity hiding in plain sight at their picture perfect school. When love becomes obsession, how far will someone go to make their twisted fantasies a reality? And who has the power to stop them? A twisty, turny mystery loaded with the perfect punch of satire and heart. Maggie Thrash grew up in the South. She is the author of the graphic memoir Honor Girl (a Los Angeles Times Book Prize nominee). 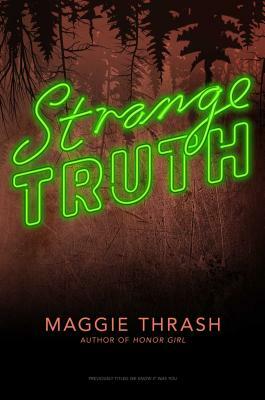 Strange Truth and Strange Lies were inspired by her experiences at an exclusive prep school in Atlanta, where everyone had secrets. "WE KNOW IT WAS YOU is the definition of a page turner. Thrash's unique ability to balance humor, mystery, and teen angst blew me away. Hilarious, twisty, and full of unforgettable characters—this is damn good stuff." "With WE KNOW IT WAS YOU, Maggie Thrash has proven she can do plain old words every bit as well as she does words and pictures. Here's a whodunnit that's less about whodunnit than about howitwasdun, a twisted mystery of mascots, cheerleaders, and the unlikely duo that has to untangle all the knots . . . just as wonderful as it is hilarious."